COJOT has created a family of tunable adaptive antennas for handhelds, manpacks and vehicles cover 30 - 520 MHz for enhanced communication performance. Tuning is accomplished by fast PIN-diode switching autonomously or by radio control. 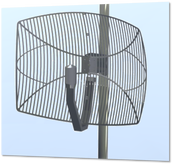 Many versions of this innovative antenna are available, the 225-450 MHz one seen here, each delivering great gain and directivity. All use wire radials that are held in tension during operation, collapsing to a compact unit for storage and transport. Parts are permanently attached to prevent loss in the field. Power handling up to kilowatts. Designed for general purpose long range H/V/UHF communications, monitoring and interception applications, these antennas are constructed from aluminum with an epoxy paint finish, the RLP100-500 is lightweight and durable, ensuring many years of trouble free, high performance service. 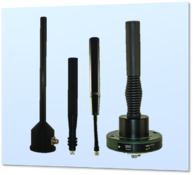 A variety of wideband omnidirectional antennas from COJOT for manpacks and vehicles cover 20 - 6000 MHz for communications, countermeasures and monitoring applications. Dozens of models are available, some requiring a groundplane, others ground plane independent. 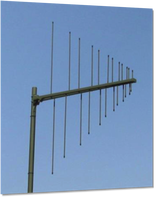 Below is a sampling of these rugged and well-performing antennas. 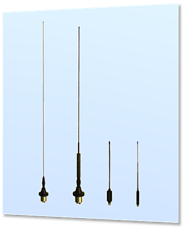 These high gain omnidirectional antennas use co-linear design with integrated balun, making them groundplane independent and suitable for use on many platforms, such as manpacks and mobile electronics. The radiator is in the top half of the radome to mitigate HERP. Designed for use in extreme operational environments. These wire antennas enable high power communications for NVIS, short, directional and long range in the HF band. A mast kit is required to support the wire radiators. These communications antennas for vehicles cover typical bands used by military COMMs systems. They are omnidirectional and rugged for use in harsh environments. 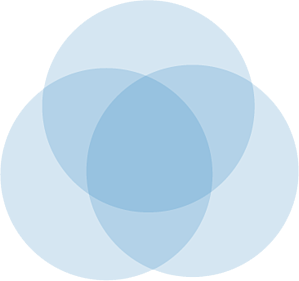 Similar vehicle antennas for commercial COMMs bands are listed in a similar position of the Counter-RCIED page of this site. These high gain omnidirectional antenna are ideal for civil and military air traffic control bands, and tactical data links, achieving twice the range of a standard dipole design. Can be fixed site or mast mounted, and the radials are removable for storage and transport. 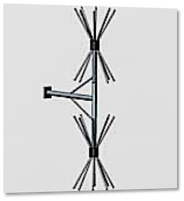 These high gain reflector antennas have highly directive patterns that allow for point-to-point communication links at long range.